Rock fanatic Charles Gaudin says he wasn't always popular with the ladies. "I'd go to parties and try to strike up conversations with women, but they'd all look at me like I had leprosy. Once, a girl kicked me in the balls just for saying hi," Charles told Rave News. "That all changed once I started collecting rocks." Two years ago, Charles inherited a dozen rubies and emeralds from his late grandmother. He fell in love with the bag of gems he'd been bequeathed, and would often spend his afternoons obsessively polishing them. 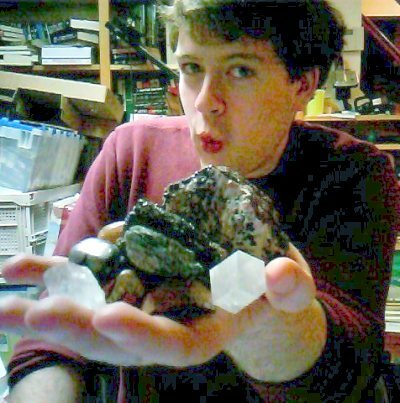 Soon after he started reading books about gems, jewels, and minerals. "Eventually, I decided to switch my University major to geology. I became engrossed with the subject. Now I live, breath, and sleep rocks. That's all I think about. And it turns out that chicks dig passion. I wasn't really passionate about anything before, but now that I am, it shows. When I invite a woman over to check out my rock collection, they always say yes." Charles first fortunate love connection at a rave happened after he decided to turn one of his grandmother's emeralds into a piece of jewellery. "I love showing off my rocks. I've got over nine thousand different kinds right now, from adularia to zircon. And if I can't bring girls home to my rock collection, than I try to bring pieces of my collection to the girls through the jewellery I make." One of his first rock related lays, Cynthia Betencourt, relates how she first fell for Charles charms. "He came up to me and asked if I wanted to touch his angelite, a pale blue rock he'd turned into a ring. And it was really pretty, so I said yes. Then he asked me if I'd come over to his place and check out all his rocks. There's just something about precious stones that turns me on, so of course I said yes." Since then, Charles has been on a roll. "I date a different girl six days a week, and then on the seventh day, I do like God and rest. if you're struggling to find love, study geology. If you know your dirt, the girls will do dirty things for you."